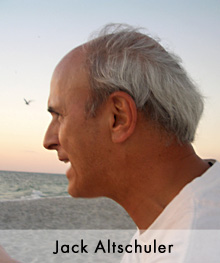 Reading time – 53 seconds . . .
Mattress Discounters will save you hundreds of dollars during their Memorial Day sale, with 48 months interest-free terms. WOW! A new mattress and free money for four years. What a great Memorial Day deal! Not to be outdone, Ashley Furniture is having a sales event with price reductions storewide and with no interest charges until January, 2021. That’s fourty-two dog years from now. But think bigger. Chevy is giving 15% of MSRP cash back on select models over the Memorial Day weekend. Isn’t that what it’s all about? I mean, aren’t we supposed to focus this holiday weekend on buying stuff on sale? What could be more American and what could be more appropriate for Memorial Day than scoring a new Chevy Cruz at a discounted price? And be sure not to miss the last chance to subscribe at a significant discount this Memorial Day to the magazines you won’t read. 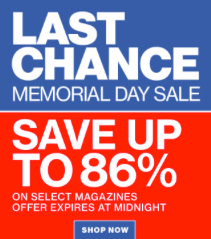 Time is running out, so click through that email to the website where they honor Memorial Day by offering for sale dozens of magazines you haven’t heard of. Somebody please tell me what mattress, furniture, automobile and magazine sales have to do with a holiday dedicated to remembering our military dead. When did we shift from the intent of Decoration Day – the original name for Memorial Day, a time reserved for decorating the graves of our fallen military – to crass commercialization? Are we such world class avoiders that we just don’t want to think about our sons and daughters having died on the field of battle? Or is it that we are that easy to distract? That’s significant, because if we are, then we are easy to manipulate and that assures constant war. After all, if the sale is good enough or if the sporting event is exciting enough, we won’t notice our dead soldiers. That’s good for both business and politics because it benefits war materiel profiteers and their political puppets. It’s a day to honor those who have served – or are currently serving – our country. 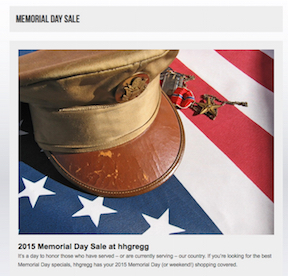 If you’re looking for the best Memorial Day specials, hhgregg has your 2015 Memorial Day (or weekend!) shopping covered. The picture is of a couple of war medals, dog tags and an old cover sitting on a flag. Now go buy a TV. They didn’t even get right their description of the day. They say it’s to honor those who have served, but that’s wrong. It is to honor those who were killed in action. Dead people. And hhgregg seems to be dead to that reality. Is that what we have become? 2 Responses to What Have We Become? This irreverant, and crass commerialization of every holiday, secular or religious, is totally in keeping with the country’s core value – making money, lots of money. While I am not in favor of the old Blue Laws, the fact is that the only days all businesses are closed are Christmas and part of Thanksgiving. That maybe three businesses in the whole country are closed on Sunday- the Christian Sabbath – loudly proclaims the “god” Christians and the nation value most: making money and buying things. And on the other end, we turn the dead into martyrs and saints, making war a noble adventure, rather than the sometimes necessary (but not as often necessary as we make it) horror that it is. The dead are to be honored for their commitment, their courage, their sacrifice. Mostly, they are to be grieved for the loss (dare I say waste?) of young lives in the name of causes too often petty or invented.